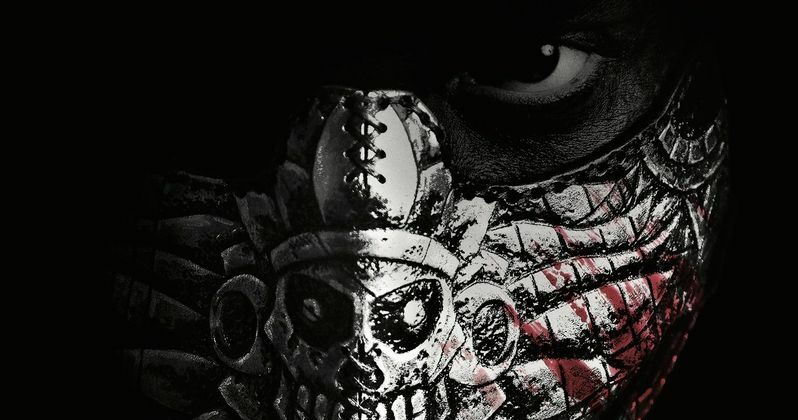 We have a brand new trailer for El Chicano. This is a movie that may not be on many people's radar yet, but it looks like perhaps it should be. It's going to be a crowded summer movie season, with Avengers: Endgame, Godzilla: King of the Monsters, The Lion King and Men in Black: International all on the way, amongst many others. But we're going to need to make room for this as well, and it looks like this could be a welcome, bloody R-rated break from the usual blockbuster summer flicks. The trailer paints a picture of a gritty, violent, action-packed crime drama. There are some serious Punisher vibes going on here, as we have a man, formerly on the right side of the law, taking things into his own hands. There are also some mild John Wick undertones in there as well, which can't be a bad thing. In the trailer, the titular character is referred to as "the ghetto grim reaper," which certainly paints a vivid image. El Chicano centers on L.A.P.D. Detective Diego Hernandez, who is assigned a huge case investigating a deadly and formidable cartel, he uncovers links to his brother's death, which was thought to be a suicide, as well as a turf war that's set to dominate his neighborhood. Diego becomes torn between playing by the law and seeking his own brand of justice. He decides to resurrect the masked street legend known as El Chicano as he aims to take down his former childhood friend and current gang boss. This comes from director Ben Hernandez Bray, who has worked as a stunt coordinator in the industry for some time. Bray co-write the script with his good friend Joe Carnahan, director of movies such as The Grey. Carnahan actually bailed on writing Bad Boys for Life to do this instead, which says a lot. Carnahan, who spoke about the movie a bit last month, has faith that he made the right decision. "My best friend and former stunt coordinator Ben Hernandez Bray had been talking about El Chicano for over 10 years and having lost his own brother to gang violence, there was a very real life corollary with the story. Ben always said that as a Latino, he never really identified with Batman, or 'a billionaire white boy who worked out of a cave.' I was working on Bad Boys for Life and got kind of fed up with that process and really believing in my friend and the story he wanted to tell, I threw myself into El Chicano and now, two years later and our pockets drained, here we are, with this fantastic movie, opening Cinco De Mayo weekend, right after The Avengers: Endgame. I think this date, at the top of the summer, speaks volumes about how good the movie is and how much confidence Tom Ortenberg and everyone at Briarcliff has in El Chicano." In addition to the new trailer, we've also included a new poster for the movie for you to check out. The cast includes Raul Castillo, Aimee Garcia, Jose Pablo Cantillo, David Castaneda, Marco Rodriguez, Sal Lopez, Marlene Forte with Kate del Castillo and George Lopez. El Chicano is set to hit theaters on May 3. Be sure to check out the trailer from the Briarcliff Entertainment YouTube channel below.